Main order counter / will-call area. 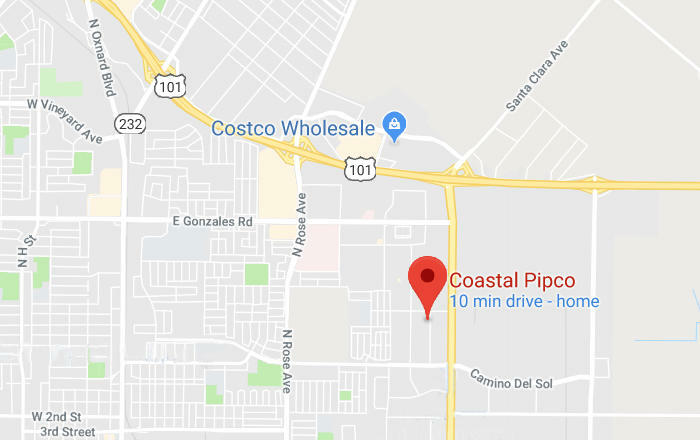 Coastal Pipco has been doing business in Ventura County and neighboring areas for more than 50 years. The merger of Coastal Waterworks and PIPCO (Plastic Irrigation Products Company) 35-some years ago created a diversity of products that continues today. We are a stocking, wholesale distributor at one location in Oxnard, CA with over one million dollars in inventory. About half of our business is directly involved in supplying complete agricultural and landscape irrigation systems. We have a broad-based pipe, valve and fitting inventory that provides excellent service to a variety of businesses including general construction, sewer and drainage, plumbing, manufacturing, facilities management, ag spray and chemical injection and water and waste treatment. Our business philosophy is based on the simple understanding that we share in our customers' prosperity. When our customers do well, we do well. Anything we can do to enhance the business health of our customers makes sense to us. Some of the ways we take care of our customers are simple and obvious; some are not. 5000-gallon vertical water tanks in overstock area. We maintain a huge selection and quantity of inventory in one location. More than 97% of orders are shipped complete on the day of the order or within a day or two. We work hard to make sure backorders and special orders are supplied quickly so you aren't left hanging. We know that the more quickly you can finish your work, the better off you are. Pricing is fair, reasonable and consistent so you don't have to keep an eye on us. It makes no sense to take advantage of our customers; we want you to keep coming back. Less obvious is the amount of work we do to make sure that even a $5.00 order is complete. It may take 20 or 30 steps to make sure everything is here for you; that is what we do day-in and day-out. Much less obvious is our computer system. The software is called Eclipse and it is capable of running the largest distributors in this country. For us, it's like having 5 more people on our payroll, taking care of the details and making sure that nothing falls through the cracks. The computer does the pricing and product ordering the same way every day. In the fairly near future, this software will enable us to run a fully integrated website order entry and account tracking program. Some people are afraid of computers; we recognize it as an incredible tool. Our greatest asset is our staff. There are many, many years of experience here for your benefit. It is the people who work here that make the computers and the company work and provide you with just what you need. If you are somewhat like us, you will be skeptical and disbelieve most of what you've read here. It is unfortunate that there is little accountability in the claims people make about their companies and services. We hope that you will check us out and develop your own experience with us. Please review the pages in our website, especially doing business with us. The information will save you time and money and simplify your life.